Employees working in leisure, culture and sport roles take more sick days than any other industry, a new study revealed. Teachers take above the national average at 3.17 days per year, while those working in the manufacturing industry or industrial labour take the fewest days off sick a year (1.59). In comparison the average Welsh employee takes just over two and a half sick days per year. The research showed that 18 per cent of workers in Wales have been injured or made ill as a direct result of doing their job. And sometimes serious illness or injury is unavoidable with nearly a third of workers of workers studied in the region experiencing something that prevented them from working for a whole month or more. However, just one in ten Welsh workers have insurance protecting them should they be unable to work for long periods of time. 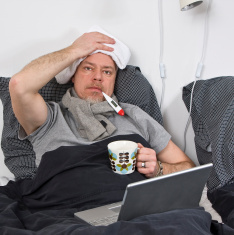 Health workers across the UK rated their boss the most strict when it came to taking sick days and also felt they were worked too hard with too few staff – 47 per cent felt this led to them being susceptible to illness. 43 per cent of Welsh workers dread having to make the call to their boss to tell them they are sick- with flu, stomach bugs and viruses the leading causes of missing work. Similarly, 31 per cent admitted they put on a ‘sick voice’ if ringing in to get a day off work. More than half of the region’s workers have needed a sick day but been too afraid or unable to take one because of work pressures – on a national scale the health industry feels that most with 57 per cent of workers experiencing this nationally. Yesterday Philippa McLaglen, Marketing Manager from There® explains: “Our research shows that we really are a hard working nation, with hardly a shirker amongst us. There is a low average number of sick days, and we feel the pressure when we do have to take time off for illness.